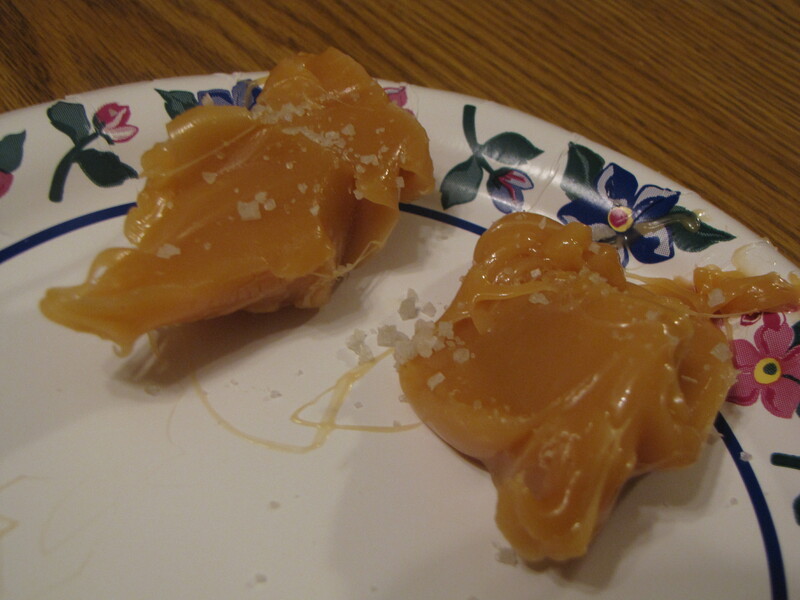 Tonight I had a great idea…homemade ice cream and caramel topping!!! Combine in a saucepan and bring to a rolling boil. I boiled for about 20 minutes or so, and I stirred periodically. I did not go by temp this time, so I don’t have a temp for you. It will cook way down and get thicker and…well…caramel colored. My Real Salt showed up today in the mail. I was getting a little stressed out. 🙂 I had a little bit left and we wouldn’t have made it through the weekend. I didn’t have a trip planned anywhere that we could get it so I would have been out of luck. We love Real Salt. Alot. The taste is fantastic. The color took my kids a little bit to get used to – it looks almost like light sand – but they got over it fast. Now I don’t think they’d know what white salt even was if they saw it. We used to use plain old table salt. However – it contains anti-caking agents such as potassium chloride, calcium phosphates and fumeric acid. Some salts also contain sugar in the form of dextrose. I did a little looking after we started the GAPS Diet and found that fumeric acid is actually a derivative of corn. A big “no no” if you are a) allergic to corn (like me) or b) on a grain free diet (again, like me!). Chemically altered salt of any kind is nothing like the real deal anyhow. They have been generally heat processed and have lost much of their natural trace minerals. Pretty good for salt, huh? I should add one more thing in my non-medical opinion. I work with elderly folks and/or people with various medical issues, including high blood pressure. I frequently hear “I can’t eat salt”, “I’m not supposed to eat salt.” Emphasizing my “non-medical opinion” again 🙂 – I’m going to add a well-written link regarding this topic right from the Real Salt website. Regarding medical issues, good quality sea salt intake is also very important for people dealing with adrenal fatigue (one last time, like me! )…I find myself going through alot of it quickly. Keeping in mind that on the GAPS Diet, we eat no processed foods, so there is no “built in sodium” (think: frozen pizzas, stuffing mix and canned soup – YIKES!). Anyhow, if you have blood pressure issues, please do your own research and/or talk with your doctor – I am simply providing this info as a “better option” that is worth exploring. I got my Real Salt this time from Vitacost, although I generally buy it in bulk through our local food co-op. I am not an affiliate of Vitacost, nor am I getting “kickbacks” from Real Salt. 🙂 Signing off to go and make some chicken stir fry…happily using my Real Salt. Good night!